Bishop Declan Lang of Clifton diocese has condemned the violence that has gripped both Israel and Palestine. In a statement, he expressed his concern about the “indiscriminate and relentless” attacks by the Israeli military on the civilian population of Gaza. “These increasing levels of violence have reached unsettling proportions following the tragic murder of teenagers in both Israel and Palestine,” he stated. 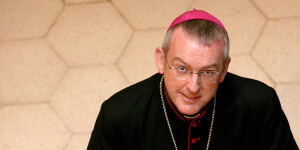 The bishop, who is Chair of the International Affairs Department of the Bishops’ Conference of England and Wales, stated that this recurrence of violence did not happen in a vacuum, but follows the collapse of negotiations between Israelis and Palestinians which aimed to put an end to decades of enmity and lead to a just peace for the two peoples. “The answer to violence cannot be more violence,” the Bishop warned. He pointed out that Philip Gordon, the White House Coordinator for the Middle East, North Africa, and the Gulf Region, has stated that without an agreement the conflict between Israelis and Palestinians means more tension, more resentment, more injustice, more insecurity, more tragedy, and more grief. “Today, I join my voice to that of the Justice and Peace Commission of the Assembly of Catholic Ordinaries in the Holy Land,” Bishop Lang said. He suggested that politicians should take a leaf from the families of those dead Israeli and Palestinian teenagers who have called for calm and reconciliation. “My prayers today go out to the men, women and children of Palestine and Israel,” he said.